Researchers at the University of Toronto have discovered a fundamentally new view of how living cells use a limited number of genes to generate enormously complex organs such as the brain. In a paper published on May 6 in the journal Nature entitled "Deciphering the Splicing Code," a research team led by Professors Brendan Frey and Benjamin Blencowe of the University of Toronto describes how a hidden code within DNA explains one of the central mysteries of genetic research - namely how a limited number of human genes can produce a vastly greater number of genetic messages. The discovery bridges a decade-old gap between our understanding of the genome and the activity of complex processes within cells, and could one day help predict or prevent diseases such as cancers and neurodegenerative disorders. When the human genome was fully sequenced in 2004, approximately 20,000 genes were found. 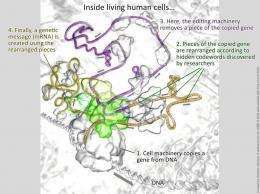 However, it was discovered that living cells use those genes to generate a much richer and more dynamic source of instructions, consisting of hundreds of thousands of genetic messages that direct most cellular activities. Frey, who has appointments in Engineering and Medicine, likens this discovery to "hearing a full orchestra playing behind a locked door, and then when you pry the door open, you discover only three or four musicians generating all that music." To figure out how living cells generate vast diversity in their genetic information, Frey and postdoctoral fellow Yoseph Barash developed a new computer-assisted biological analysis method that finds 'codewords' hidden within the genome that constitute what is referred to as a 'splicing code'. This code contains the biological rules that are used to govern how separate parts of a genetic message copied from a gene can be spliced together in different ways to produce different genetic messages (messenger RNAs). "For example, three neurexin genes can generate over 3,000 genetic messages that help control the wiring of the brain," says Frey. "Previously, researchers couldn't predict how the genetic messages would be rearranged, or spliced, within a living cell," Frey said. "The splicing code that we discovered has been successfully used to predict how thousands of genetic messages are rearranged differently in many different tissues." Blencowe's group, including graduate student John Calarco, generated experimental data used to derive and test predictions from the code. "That the splicing code can make accurate predictions on such a large scale is a major step forward for the field," says Blencowe. Frey and Blencowe attribute the success of their project to the close collaboration between their team of talented computational and experimental biologists. "Understanding a complex biological system is like understanding a complex electronic circuit. Our team 'reverse-engineered' the splicing code using large-scale experimental data generated by the group," Frey said. Note that evolution is not able to predict or explain how such complex splicing can be used to generate information required elsewhere in the body. New information to assemble new parts and how to use them cannot be "evolved" from nothing. The new information can only come from an intelligent source hence the researcher's comment about the comparison to reverse engineering complex electronic circuits. Ah, the creationists are so cute just after they have read things on the Disco Institute's website. Or maybe reading Stephen Meyer's book gave you that incredible insight, FredFred? Fred, new information can be had via several things that can, and do, happen to the DNA: duplication, inversion, deletion, and substitution (and perhaps a few other mechanisms). None of these requires an intelligent source in order to happen. Proper appreciation of the possibilities does, however, require an intelligent *observer* who has brought an open mind with him/her. These kind of findings efficiently undermine the credibility of ID 'science'. If a few genes can give rise to thousands of functional gene products via alternative combinations of gene modules, the creationist assumption of mutations (module duplications, insertions, deletions etc.) being unable to produce successfull gene variants is completely debunked. Unfortunately, no amount of evidence would be enough to convince an ID evangelist. What is hurtful about ID is that it derails any kind of further thought or productivity. For example, we should perhaps be having a discussion of how this truly fascinating research could offer inspiration and ideas to a whole raft of innovations in data processing/computer software design. Perhaps those who believe in evolution should carefully rephrase the way they express the machinations of evolution. In this particular quote it sound suspiciously like evolution [nature] is an intelligent, personal being who is able to discern with intent. It sounds like someone who has an objective to achieve and with fore-knowledge sets out to circumvent any obstacles. You can't have your cake and eat it too. Decide which you want: Intelligence and forethought or random trial and error. It can't be both, surely?. Actually, quite the opposite: you forgot that for these things to be useful, they have to have the requisite attendant controls in place. Incredibly complex control and recovery systems is what is the spanner in the works for random trial and error methods of generating new information. It can't be done. And of course, there is that one nagging weakness in his thinking with which Fred is blissfully unconcerned-- who or what created/designed god? Of course the same can be asked about the singularity from which the big bang arose. And besides, singularities are thermodynamically dead-ends, so how did it explode? Quite right on this of course. No amount of evidence would convince evolutionists either. It's the believe system that needs to change. Note that your further discussion of possible applications is totally independent of evolutionary considerations. You can perfectly well go about creating applications and not give a hoot about evolution. Just don't mention that you don't care about evolution - you might not get any funding for your project(s). No amount of evidence would convince evolutionists either. Of course it would, if it was 'actual' evidence. Not some old arguments - that have long been investigated and disproved - that ID proponents bring forward as 'evidence'. 150 years of evidence for evolution isn't enough, is it? ID is creationism, there is no science within the ideology or thought processes of ID. Have a nice day. @kevinrtrs: "Actually, quite the opposite: you forgot that for these things to be useful, they have to have the requisite attendant controls in place. Incredibly complex control and recovery systems is what is the spanner in the works for random trial and error methods of generating new information. It can't be done." This is a word salad that says nothing, means nothing and adds nothing. You're obviously covering up for a lack of education by trying to use words you've seen others put into use. As well, you're obviously not arguing against evolution, you're attempting to argue against abiogenesis, which is an unproven, but scientifically popular, theory of the origins of life. Quite right on this of course. No amount of evidence would convince evolutionists either. Difference here is for one to agree with ID they must already be a dyed in the wool supporter. In order to believe evolution one must only look at the entire body of biochemistry, medical, and genomic work and recognize that if Evolution is wrong, none of it would exist. So tell me the tenets of ID again, and then tell me why a JUDGE of all people ruled that it was utter nonsense, and the same hypothesis lain out in the Bible. Perhaps you should try and figure out for yourself what the requirements are for a cell to evolve from singular state to multicellular state. Then perhaps you'll begin to appreciate the new information content required to sustain a multicellular organism as opposed to a single cell creature. As for Abiogenesis - it's simply the evolutionists cop out when they realized they could not explain the origin of life from simple chemicals. Now suddenly it's no longer part of evolution - but try erradicating that from school level textbooks! I think you might have the sequence of events wrong. First you have to believe in evolution, then you'll find the evidence for it in the fields you've mentioned. All the fields named existed quite happily and very productively long before people started raving about evolution as the cause of all things. With "evolution" I think we should agree on the philosophy of living cells creating themselves and then transformation from a single cell into multi-organ man, animals, fish and birds. Not to be confused with simple adaptation and speciation. Your belief system dictates how you interpret the evidence before you. So for evolutionists, the 150y of "evidence" support their point of view - irrespective of true merit. All the fields named existed quite happily and very productively long before people started raving about evolution as the cause of all things. So we had genetic research before we discovered DNA? We understood the inner workings of cells before we developed microscopes? We understood how reproduction worked before we understood what sperm and ovum were? Moron creationist, all of these things are directly derived from the Theory of Evolution. Evolution doesn't speak to abiogenesis, and the fact you think it does speaks volumes to the depth of your ignorance. The theory of evolution has never spoken to abiogenesis, ever. ToE is "the manner and method by which selective social, natural, or derived pressures alter organisms within their environment." That's the whole theory, try learning it. Perhaps you need to go and re-read Darwin's book on the origins of the species? And do a good review of the history of the story of evolution while you're at it. The whole argument about evolution vs creation is whether living things made themselves or not. And then having started from one cell, evolved into man, birds, fish and animals. Changes[evolution] occurring in existing man-made things are not the issue here. Moron creationist, all of these things are directly derived from the Theory of Evolution. To take a leaf out of your own book: Did the theory of evolution directly lead to the invention of the microscope? You are ascribing advances in science to the theory of evolution. I contend that you can take away all the blabbing about evolution and science will continue just fine on it's own. Get this: you are trying to say that evolution is science and science is evolution but in reality evolution is simply a small part of scientific endevour, not the totality. Please get that right. Show me where I've err'ed. Be specific, use quotes. Actually no, but to say this is sophistry and misunderstanding of science on the whole. The Microscope is a toll that allowed further validation of the theory. Without the microscope we couldn't have proven evolution to the point we have. Are you truly this religiously ignorant or are you merely trolling? Without the theory of evolution the majority of our modern science wouldn't exist. So if you think it isn't important, go right ahead and have your physician give you a good ole blood letting to disperse your foul humors. Ahhhh!!! the pot calling the kettle black, here Skeptic. You are just as religious in worshipping "the theory of evolution". The real contention is that people like to say one thing about evolution and totally mean another. A small case in point is referring to adaptation and natural selection and then implying that that is proof that man evolved from a single cell. That is called sophistry, as you so nicely put it. What does rocket science, telecommunications, power generation, civil engineering and so on have to do with how one biological cell changed into a human being? To say that those fields would not exist if it were not for evolution is sheer malice. You are just as religious in worshipping "the theory of evolution". Wrong. Worshipping the God of the desert has no evidence, Evolution is well evidenced. Again, ignorance of fact doesn't make your ignorance factual. And Man evolving from a single cell is supportable. Man being wished into existence by a "God" is not. What does rocket science, telecommunications, power generation, civil engineering and so on have to do with how one biological cell changed into a human being? If the basic tenets of evolution were not factual the basic precepts of those scientific endeavors would not be there for you to utilize as we do today. You are aware of the underpinning theories that have allowed us to learn these concepts are you not? All systemic understanding comes from recognition that reality is a natural system. If it were not, you'd have to employ magic rather than science to do anything. It can be said that science develops at a parallel to the demands placed upon it by population growth and the problems that it creates. Smaller, less dense populations may not have placed demands upon science that larger populations have done, and so germ theory and/or vaccinations may not have been developed in the same time frame. I would actually say that the biological sciences are absolutely dependent upon evolution as an underpinning. The other sciences are only tangentially dependent upon it because of the increase in populations and the likelihood of a new theory developing from that increased population. The other sciences are only tangentially dependent upon it because of the increase in populations and the likelihood of a new theory developing from that increased population. And right there you strike on the point for why HC as a right is important. 200 years ago Hawking would have been cast off once his detriment became visible. Today he's been enabled to live his long years while enriching our knowledge of the Universe. Evolution does not subsume Science, it's a subset of Science. Is it so difficult 4U to understand that? You keep on about evolution as if it is the totality! Evolution is therefore applied and studied in fields as diverse as ecology, anthropology, conservation biology, paleontology, agriculture, medicine, psychology, philosophy and others. What this basically means is that the scientists have no absolute proof, but have great continuing FAITH that the belief in "species changing over time [from single cell to multi-cell to ape, bird and man]" will one day be proven true. In the meantime they continue trying to figure exactly how that could have happened. Or as it is shouted to the world: "Evolution is a fact". Perhaps we should just agree to disagree: You believe that things made themselves, I believe that God created everything we know of - earth, biological life, sky, stars, galaxies, the works. Using these belief systems, we then go out and interpret whatever we see. And lo and behold, we come up with different answers! The fact you continually try to advance ID as a theory even close to evolution is sad. Further, the fact that you reinforce my point in one post and then attempt to refute it in the second is even more disturbing. Why do you even post on a science website if your framework of reality requires magic? Better question, If the Universe must have a creator, then who created the creator? If your answer is no one, then why must the Universe have a creator in the first place as you believe in spontaneous generation? If someone, then who, and what is your evidence? Failing to produce a logically consistent answer to that question is why you're wrong. "A sufficiently advanced technology is indistinguishable from magic...." Arthur.C. Clarke. Check out the quantum-entanglement energy transfer happening at high temperature in the photosynthesis process - right now it's like magic to scientists. Once understood, it becomes something we can describe in known terms. I keep trying to show you that it's the belief system that determines how you interpret the evidence and hence that's why we differ. Our belief systems are diametrically opposed. An example follows in the next block. This is the same as asking "Who/what created the singularity that is thought to have preceded the big bang?" The answer to your question is that since God exists outside of time He does not need to have a beginning or an end, unlike us. God is the eternally existing one. On March 25, 2005, Science magazine reported the discovery of soft tissue in the leg bone of a Tyrannosaurus rex. [ref] The study was conducted by a team of paleontologists led by Dr. Mary Schweitzer, the scientist who found blood cell remnants in another T. rex bone in 1997. According to the paper, the soft tissue contains morphological objects that appear to be blood vessels, blood cells and bone cells. From here:http://creation.c...shosaur. You can ignore the source. Point is that given that soft tissue can only last a maximum of 100K years, the obvious conclusion should have been that the fossil could not be older than that. BUT, because it MUST be 65Ma to satisfy evo theory, the only other explanation is that it must have been preserved thru some incredibly fanatastical manner to last for 65Ma. Sounds like magic to me - not the application of logic. This is a belief system at work. The other obvious thing to have done in the soft tissue in fossil case would have been to subject the soft tissue to triple-blind carbon-14 radiometry and published the result simply as a matter of course. This isn't done because - wait for it - since the fossil IS 65Ma, it is not necessary to do C-14 testing. Thereby of course neatly side-stepping the problem of any residual C-14 being found in the specimen. Furthermore, even if it was done, the C-14 would have been written off as biofilm or some other contamination and the specimen discarded. BUT: it won't be done because in this second case extraordinary steps were taken by the scientists to prevent exactly such contamination. Hence - C-14 testing will NEVER get done. This is a belief system at work: It MUST be 65Ma. If you remove Time from God then he cannot exist. You cannot turn off causality because you so choose. You ask me what created the singularity, my answer is "I don't know yet". Your answer is "a magical being that exists outside of time." Who said soft tissue can only last 100k years? How did they prove that? This isn't done because - wait for it - since the fossil IS 65Ma, it is not necessary to do C-14 testing. Oh boy, here's your straw man again. It is not that it is unnecessary to do the dating, it was stated that it is not possible to do the dating. So we date dinosaur bones by running radiometric tests on the surrounding rock, you know, what they're encased in, and we determine their age by the presence of Uranium ions as those have a half life well into the millions of years. If you want to debate radiometric dating, go ahead and try it. You'll be proving yourself even more of a pseudo scientist. Now as to how that tissue survived, well we've discovered our prior theory of fossilization was wrong, yes, scientists admit when we're wrong. If soft tissue was encased in hardened mineral, like bone, and was removed from the elements that serve to degrade tissue, it could last far longer, much like mummification preserves documents, art, clay tablets, and of course, human bodies. It's not a belief system, it's science. And I can evidence the entire process for you without magic, without fancy imagery, and when you're done learning it, you can do it yourself to validate or invalidate my finding. It's repeatable. And that is where your belief system falls on it's face. You cannot ever repeat your findings consistently, while I can continually work my "miracles" and do things like cure disease, feed the poor, and all of those other nice salvationy things you attribute to Jesus. Difference is, I don't want you to worship me for it, I want you to smarten up and help me do it for everyone else. To do otherwise is evil, Jesus said so. Hey kevin, how old is the earth? Seems like you guys just don't get it. Your belief system dictates how you interpret the evidence before you and this is why arguing about who is right is actually futile. Those belief systems just don't meet. As for how old the earth is - it's a little older than the argument itself. That's about all anyone can say since no one [human] was there to witness and record the birth of it. Using radiometric dating methods cannot prove how old the earth is since it simply relies on questionable assumptions. No one knows exactly how much Uranium or lead there was right at the beginning [ or argon or strontium or whatever you wanted to use]. No-one can be absolutely certain the wasn't any inflows or outflows into your measurement env. Hence you always have uncertainty in your calculations. @Jayk, Thanks for providing the link. it was so predictable. No, no I don't, pay attention. No, common sense tells me how to interpret the evidence. I rely on science and knowledge from more current sources than a 2000 year old storybook. @Skeptic - you STILL don't understand that your commonsense is guided by your underlying beliefs. Doesn't your commonsense also tell you that if there's code, there has to be a programmer. For the simple reason that the purpose of the code is to reach a set objective? Evolutionary theory indicates that there cannot be any set objective, it all depends on slow, random change. Hence code negates it. By the way, YOU brought up the 2000 year old storybook - another indication that you're basing things on assumption. I'm reasoning from a critique of the evolutionary theory as it stands. It would seem that YOU're the one with the closed mind and blinkers on since anyone and anything that speaks against your religion of evolution is an idiot. Actually it's this dogged believe in evolution that is setting science back into the dark ages where people lost their lives. Similarly if you don't believe in evolution your funding and standing in the community is obliterated. Go figure. human brains and eyes cannot conceive nor understand. Funny how they think they can know everything. Actually no, and this can be experimentally evidenced by modern computers running raw environmental data. The Universe is made up of rule that govern particle interaction. Expounding upon these rules ot greater and greater frames of reference WITH NO INTENTIONED INTERFERENCE produces evolution within self assembled code. This is proved many fold in many ways. Most of which you can find on youtube of all places. I'm reasoning from a critique of the evolutionary theory as it stands. No, you're operating off of your perverse misunderstanding of Biological and Systemic Evolution. It would seem that YOU're the one with the closed mind and blinkers on since anyone and anything that speaks against your religion of evolution is an idiot. Actually it's this dogged believe in evolution that is setting science back into the dark ages where people lost their lives. Sorry, stop right there. This is utterly inflammatory. Divine providence and devaluation of non-dogmatic personas is killing people RIGHT NOW thanks to your belief system. Go ahead and google AIDS, Africa, Christianity and tell me what's going on. Similarly if you don't believe in evolution your funding and standing in the community is obliterated. Go figure. Not hard to figure out. If you don't believe the massive amounts of scientific data involved in the statements of Evolution you are unworthy of scientific funding. A ten year old can fully understand evolution with ease, assuming they haven't had their intellectual well poisoned by your ilk. This is your chance, prove evolution wrong. Since it's so easy, do it right here, right now, and collect your Nobel Prize. I'm waiting. SH: You might want to mention that our current head of the NIH is a rabid christianist that uses his office to spread his religious influence. The NIH is also where a lot of funding comes from, so the implication above by kevin that there is some kind of insidious conspiracy effort to keep christianists from funds is just another "oh no, I'm a poor persecuted majority" kind of thing that has no real basis in reality. Out of the millions of dollars being spent at the Disco Institute, the only thing they have is Casey Luskin sending out ignorant blog postings and Stephen Meyer publishing non-reviewed books that contain massive mathematical errors and flawed logic. Go back to Uncommon Descented, kevin, you really don't know what you're doing here. There's no need to even go there. Evolution was proclaimed as proved factual science by Christians as far back as 1901. There is no dispute as to the validity of evolution anywhere except in the minds of those who take creation myths literally. So those few people in this world, Primarily Seikhs, Hindus, Xtians, and Muslim fundamentalists, are intentionally ignoring reality and as such can be called mentally deranged. The only reason there is any debate to the validity of evolution is because the literal interpretationists of dogmatic religous institutions feel that if you can prove part of their holy book as false, that the whole book must be false. Evolution doesn't disprove theology, but it disproves creation myth, and those with a low enough intellect to believe in the creation myths of whatever dogmatic religion they ascribe to are dumb enough to disbelieve evolution. This is further evidenced by their inability to disprove any aspect of evolution. I was asked in PMs why I'm so vehemently opposed to creationism and in some cases "waste my time" disproving the statements of creationists and this is the "Why". I don't debate dogma to make the dogmatists "believe" what I'm saying. They've already fallen down the rabbit hole. I write on this topic so profusely and with such disdain for ID to prevent others with salvagable intellect from also falling down the rabbit hole. Creationism is born of a closed mind. In order to believe in ID and creationism, (because they're one in the same), one must ignore or be ignorant of reality. In some cases adherants are told when their dogma and reality differ, reality is wrong. This is delusional insanity, and to not immediately strike it down is a greater evil than to propagate it without knowledge of its inaccuracy. Kev serves as an example of idiocy. Those of you remaining quiet, out of some sort of fear of offense or political incorrectness, are an example of ethical evil. Mmmmhhh. Poor Kevin. Taken to the cleaners on this. Creationism is born of a closed mind. In order to believe in ID and creationism, (because they're one in the same), one must ignore or be ignorant of reality. In some cases adherants are told when their dogma and reality differ, reality is wrong. Strange but you should just re-read that to yourself and see YOURSELF in there! Also ignoring reality from the creationist point of view. Simply replace creationism and ID with the word evolution. Why is this? Simply because you have the miracle of LIFE which you cannot bypass in any manner whatsoever. You are just as unwilling to accept that evolution cannot be proven and insist dogmatically that it HAS been proven. It's a thing that happened in the past and so can only be investigated forensically and the evidence interpreted according to a philosophical uptake. In fact it's the same as religion because you have to have faith in the philosophical assumptions you make!!!! We don't insist that evolution is proven, we can repeatedly prove it. Go ahead and place your challenge to evolution and I will soundly refute it. FredJose, take two minutes and go look at fruitfly experiments, then take 2 shut-the-hell-up pills and go play "edumacated" somewhere else.